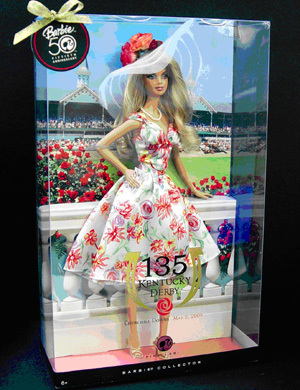 With Kentucky Derby® 135, on May 2, 2009, quickly approaching, Churchill Downs, the legendary racetrack that hosts the annual “Run for the Roses®,” and Mattel teamed up to create the Kentucky Derby® Barbie® doll. This year, Barbie®, the ultimate fashion icon, showcases legendary Derby fashion with the launch of the Kentucky Derby® Barbie® doll, dressed in a playful floral sun dress, faux pearl necklace and sassy spring sandals. True to Kentucky Derby fashion, Barbie doll’s look is topped off with a stylish, oversized white hat with blossoming flower accents. In addition to the Kentucky Derby® Barbie® doll, Churchill Downs and Mattel gave Barbie® enthusiasts and collectors a chance to own their very own life-sized Kentucky Derby® BarbieTM replica hat. Renowned milliner, Christine A. Moore, created 135 replica hats to commemorate the 135th Kentucky Derby and the Kentucky® Derby Barbie®. The first hat was auctioned off through the Clothes® Off Our Back Foundation on Monday, April 20 for $1,350 to a man in Mays Landing, New Jersey. Proceeds from the auction benefit Clothes® Off Our Back’s charities, including Feeding America (formerly named America’s Second Harvest), The Art of Elysium, Hope North and H.E.L.P. Malawi. The remaining 134 hats are available on a made-to-order basis on www.thederbystore.com.